“What mov’d me to it? To murder him who sacrificed my peace? Ugolino, in his final scene of this bloody drama, steps forward, his sword upraised, ready to plunge the blade into his chest, and shrieks, “Come my bride…to Hell’s center! In my heart I plunge this reeking sword!” The play ends with Ugolino’s suicide. 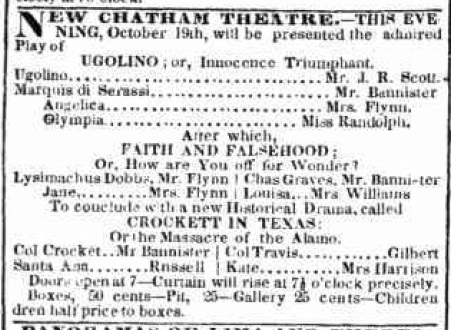 The original debut on April 20, 1825 was at Philadelphia’s Arch Street Theatre and was a benefit for Mr. Henry Wallack, with him and his wife playing Ugolino and Angelica. Though celebrated by some, Ugolino did not become a house hold name. From its initial April 20, 1825 debut onward, it was produced quite sparingly. In the years that followed, the actor John Randolph Scott seemed to be the only one who made it part of his repertoire. It was performed by Scott at the Bowery Theatre and Chatham Theatre in New York City. 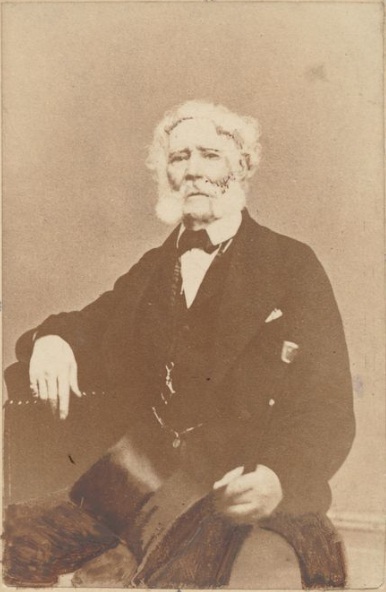 When J. R. Scott died in 1856, the play saw even less exposure. John Wilkes was not the first Booth to perform in Ugolino. 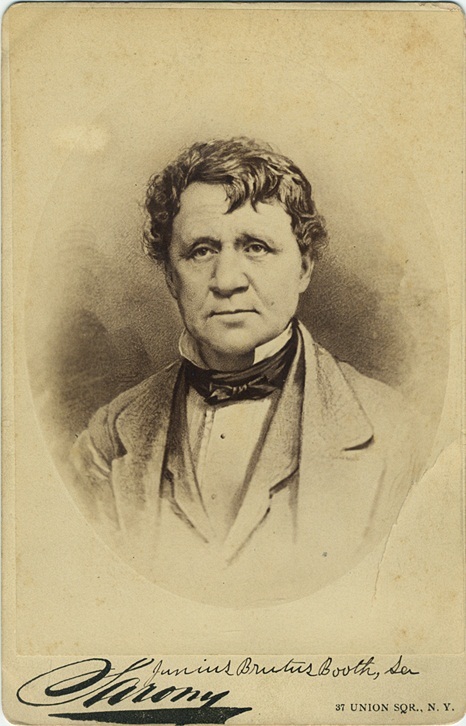 In December of 1849, Clementine DeBar Booth, the first wife of Junius Brutus Booth, Jr., performed the play alongside J. R. Scott at Howard’s Athenaeum in Boston. While John Wilkes did choose to perform Ugolino as a benefit due to a family connection, it was not this coincidental connection to his former sister-in-law. 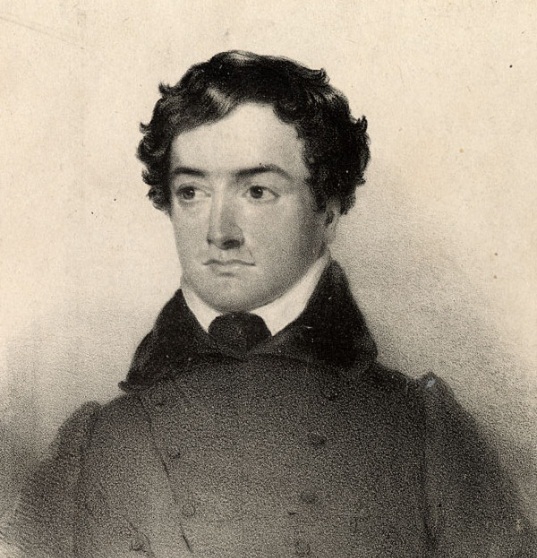 Rather, John Wilkes Booth decided to perform the little known play Ugolino because of his connection to the playwright. Ugolino was written by his father, Junius Brutus Booth, Sr.
Ugolino is believed to be the only play that Junius Brutus Booth, arguably the best tragedian of his generation, ever wrote. What’s more, I have yet to find any source saying that Junius performed in or even had a chance to see his own work on stage. When Wallack put it on as a benefit in Philadelphia in 1825, Junius was performing in Baltimore. When Junius’ friend J. R. Scott was reviving it in New York during September of 1834, Junius was himself busy performing elsewhere. If Junius had the chance to attend one of the rare dramatizations of his work, it does not appear to be documented. Though time robs us of experiencing Junius Brutus Booth’s true theatrical gifts first hand, these few lines are a fitting self-epitaph to his effect on theatre history. Fascinating! Never heard of this before. Thank you for sharing. 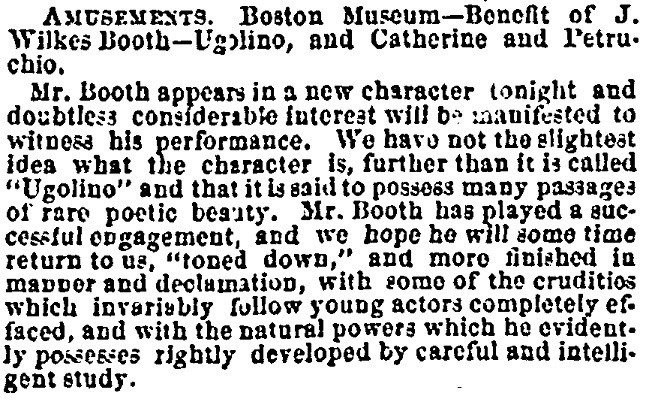 When JWB appeared in Ugolino in Boston the New York Clipper had mentioned that Junius Brutus Booth, Jr. would appear, but he did not. Thanks for the info, Art! I wonder what small part supernumerary Wilkes played in Ugolino in 1858. Also, Art, am I correct in the fact that Ugolino was not Booth’s last performance at the Boston Museum during his run there? Gordon Samples’ book puts it as his last, but I found a newspaper article for the next day with him performing something. Can you verify? He played The Corsican Brothers the next day, Saturday, which closed the run, the season and career.